Ostensibly set in the present day, Daniel Espinosa’s Life didn’t, at first, feel much like any “present day” that I recognize. 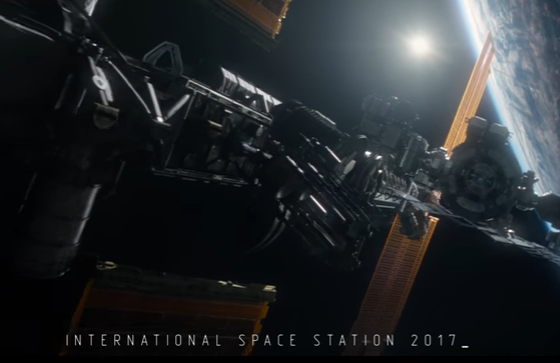 Before the main events of the movie begin—before it becomes an Alien-style monster-on-the-space-station movie—we see a basically united and well-balanced humanity, exemplified by a happy family of American, British, Russian, and Chinese astronauts, male and female. As the crew advances boldly into the unknown, struggling to bring to life a long dormant fragment of a Martian life-form, we see an earth apparently populated by dreamers and idealists who follow along with the wonder and awe of a child dreaming of the stars. It’s what Star Trek occasionally fashioned itself as being, minus all the magic technology and military hierarchy, the best of humanity: social, empathic, curious. It’s mostly gestural, of course; there are no info-dumps to tell us that we are in a space-utopian version of real life. Indeed, there are a handful of careful indications that we aren’t. The carnage and destruction of the Syrian civil war is explicitly mentioned, for example: Jake Gyllenhaal’s soulful doctor has set a record for days in space because, as he explains, what he has seen on earth sickens him. Space is clean, free, and peaceful; there is no violence. Until the main events of the movie begin, he seems to have a point. In space, so much that composes our “present day” is glaringly absent. Space does not seem to be the terrain for corporatist struggle or an international arms race; there’s no trace of any Elon Musk “Billionaires to the Stars”-type project, nor does the military industrial complex make any appearance. Instead, we see the present day that a liberal baby boomer might have imagined it would become, perhaps, had the decades since Star Trek: The Next Generation went off the air gone differently. And then everything changes with a really bad handshake. The alien in this movie is not Trump—not exactly–but as you watch our team of hyper-educated, cosmopolitan, and multiracial liberals get routed by this creature—as their jovial teamwork and careful division of labor and skills is utterly outmatched by single-minded entity whose every cell carries out every function—it’s hard not to see a certain parallel with how capitalism is killing and eating liberalism. Our heroes spend most of the movie being completely at a loss as to how to combat the thing, building walls and hiding—at one point, they literally lock the doors, hide in a room, and wait for it to go away—and never coming close to developing a real plan. That they have no weapons with which to fight it—why bring weapons into space?—is part of their problem; they are fragile human bodies, susceptible to damage and death, and it is fast, powerful, and hungry, so it kills them off, one by one. Another problem is that human society operates through specialization, and as the creature kills different parts of the crew, it deprives the whole of that person’s expertise. When they lose the space-walker, the commander must do the space walking, such that when they lose the commander, that function, in turn, devolves onto others less skilled at it. At each turn, distributing these functions makes them vulnerable, and we see the creature attack that vulnerability, tearing the whole apart, piece by piece. The creature, by contrast, has every function combined in every part of it: we are told, early on, that each cell contains brain, muscle, and sensory functions (and presumably digestion). After they bring the thing to life with glucose, it spends the rest of the movie eating human beings for more glucose; it lives by eating other forms of life. What it doesn’t seem to have, however, is a reproductive system. It never makes another version of itself; it only eats and grows. In this sense, if Life is an Alien knockoff—and it is—then the interesting difference is that this monster is totally asexual: evacuated of all the rich phantasmagoria of reproductive nightmares that made Ridley Scott’s film so iconic, this creature just eats and grows, eats and grows, eats and grows. What do you do to fight such a thing? In retrospect, it doesn’t seem like there was much. The only answer our heroes come up with is to use its greed against it; the only plan that works, even a little, is to offer it something to eat and then anticipate that it will immediately eat it, which it does, every time. (Spoiler Alert: this plan doesn’t work very well.) But they figure this out much too late. And everything they do until that point gets used against them, by a creature who turns out to be nothing other than the predatory negation of whatever it is they are. In this sense, the movie is a parable for unsustainable capitalism, for a mode of life that strip mines the world for what it can eat (and grow) and which freely becomes whatever it needs to be in order to keep eating; having no identity of its own, it has nothing you can kill, and being killed is a function that has been devolved onto the living. Meanwhile, those who have been living in denial about all the killing that we already are–we retreat to fantasies of space-utopia while life is snuffed out on earth–are in no position to do anything. So, yeah, a pretty precise encapsulation of the present day, chillingly familiar. By the end of the movie, we can deduce what must have happened to Mars: the creature simply ate everything and then starved to death. This is what happens to the endless drive for growth: because the creature doesn’t reproduce, socialize, or seek to sustain itself—because it simply eats and grows, and because it does nothing else—human society cannot compete, and won’t. When you extend a hand to it, in friendship, it takes your hand, and eats it.